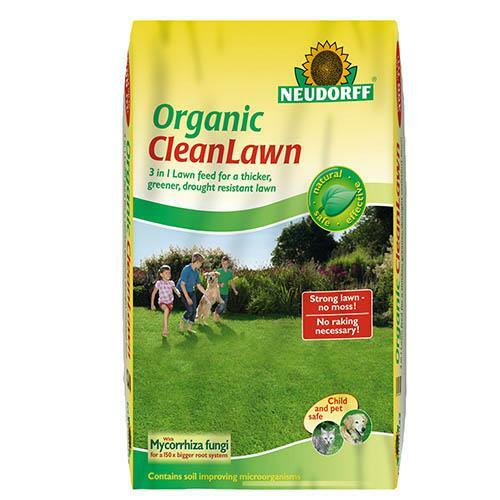 A convenient and environmentally friendly way to protect your lawn, CleanLawn features a 3-in-1 organic formula and contains only natural ingredients, including beneficial Mycorrhiza fungi to increase the size of the root system by up to 150 times and make it more resilient to weathering. The 3-in-1 formula fertilises, improves soil, and has an indirect action against moss, producing a thick, naturally green lawn. Once applied it will start feeding the lawn quickly and continue do so for up to 100 days. Plant growth is not disturbed by application and there is no risk of it scorching the lawn. Its soil restoring microorganisms work hard to disrupt unhealthy bacteria and promote the growth of thick green shoots and break down lawn thatch and moss growth, leaving behind a green, healthy lawn without the need for backbreaking scarifying. Whether your lawn is newly laid or not, the fast-acting fertiliser continues to feed for up to 100 days after the first application and is suitable for use in spring, summer and autumn. Granulated and easy to spread across the lawn either by hand or with a spreader, it’s safe for use around children and pets, meaning treated areas can be used immediately after application. CleanLawn is supplied in a handy 2.5kg bag and covers 50m2. Supplied in a handy 2.5kg bag and covers 50m2.